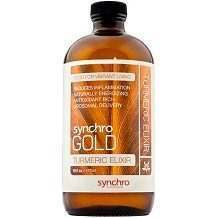 This is a review of Synchro’s Gold Turmeric Elixir, which has been shown to not only reduce inflammation, but also boost the immune system and brain function while increasing energy levels naturally with no crash. Using high quality, organic ingredients, this claims to be one of the more potent supplements on the market today. The two main ingredients in this supplement are organic turmeric root extract and organic black pepper fruit extract. The organic turmeric root extract is harvested through a proprietary CO2 extraction system, this creates an especially potent turmeric extract, and makes it more readily absorbed by the cells. Besides reducing inflammation that can cause joint pain, turmeric also boosts the metabolism, giving you an extra kick of energy while encouraging higher calorie burn. Cognitive functioning is improved because of the anti-inflammatory properties and enhanced by the antioxidants turmeric provides. Organic black pepper fruit extract, standardized to contain 95% Piperine, enhances the body’s natural ability to absorb nutrients, which increases the effectiveness of the turmeric in this supplement. It does this by reducing the amount of turmeric broken down in the digestive system so that the health-boosting effects remain intact to be absorbed by the cells. With a combination of organic, non-GMO ingredients strategically combined for maximum absorption and benefit, this supplement claims to offer one of the highest doses of turmeric available. Because it is extracted using a proprietary CO2 extraction, it allows the turmeric to retain all of its beneficial properties, which react in the body as if you consumed turmeric root directly. This product comes in a liquid form. For best results, take one to two servings a day. It is recommended to mix 1oz of the formula with 4-6oz of a warm non-dairy milk drink and some honey. You can also drink the 1oz of formula on its own, but it will have a very strong taste. Women who are pregnant or breastfeeding should consult a doctor before taking this supplement. 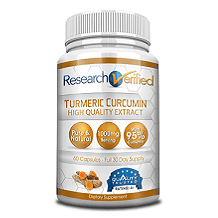 As turmeric has a mild blood-thinning effect, anyone with a blood disorder or who is taking medication for blood thinning should consult a doctor before taking this supplement. One bottle containing 16 servings is available to purchase online through the manufacturer’s website for $28.97. This will only get you a two week supply. Purchasing two bottles gives you a 5% savings and costs $54.97. Purchasing four bottles saves you 10% and costs $103.97. You can return unopened bottles of Turmeric Elixir within 30 days of your purchase for store credit, but there is no return policy if you find the product ineffective or do not like the results. This limited return policy does raise concerns. There are also not many options to use the store credit for. Not only is this product organic and non-GMO, it is cGMP certified, and is gluten and dairy free. This makes it suitable for a large number of people. The liquid formula is especially bioavailable, and customer reviews of this product are around 90% positive, reporting both reduced inflammation and pain, as well as increased energy levels. The lack of a comprehensive return policy does raise some concerns, especially as the product is marginally more expensive than many similar products available on the market. The taste may also be a bit strong for some people.